The second quarter of 2009 saw AP taking on a more active role in the PHDC research and dissemination project funded through the EU 6th Framework programme. 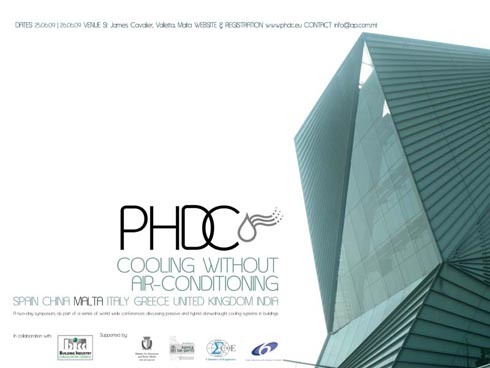 As part of a series of world-wide symposia previously held in Spain and China, Malta was the third country to host the PHDC ‘Cooling Without Air-Conditioning’ conference. The office was responsible for the organisation and coordination of the event. The conference was spread over two days and attracted a healthy range of delegates from Malta and Europe involved in architecture, engineering, industry and government agencies. The first day consisted of a symposium with speakers from the project partnering organisations elaborating on the theme of passive and hybrid downdraught cooling systems in buildings. The second day of the event was an interactive workshop where the conference delegates were given a demonstration on the software developed as part of the research. The delegates were also given the opportunity to visit the Malta Stock Exchange in Valletta. The building houses the first PHDC (Passive Hybrid Downdraught Evaporative Cooling) system to be implemented in Europe. Delegates were guided through the building and given a detailed explanation of how the cooling system works. The conference was well attended, having over eighty delegates registering for the event. The aim of the event was to disseminate information about the PHDC systems. Delegates were therefore given a copy of the latest draft of the sourcebook currently being finalised which also includes detailed case studies, each showcasing an example of the application of PHDC as part of the building’s cooling strategy. Details of the upcoming symposium to be held in Greece will be displayed on the PHDC website (http://www.phdc.eu/).